Tunisian President, Beji Caid Essebsi, reiterated his commitment to working with Ennahdha Movement Party, which, according to him, had restored Tunisia?s stability. In a lengthy interview with the Tunisian television on Monday evening, Essebsi said that ?Ennahdha Party has made great efforts separating between the preaching and the political discourse, and that, under the leadership of Rached Ghannouchi, it has taken considerable steps in the path of moderation though that is not enough.? Essebsi pointed out that coexistance with Ennahdha Party has succeeded and there is no objection to its continuation. He said: ?With coexistence we achieved a good stability, and it was a successful experience with positive results for the Tunisian people. Since the experience was successful, it is better that we pursue it? In previous statements to?Quds Press?this week, Ennahdha Party leader, Sheikh Rached Ghannouchi, had confirmed that his movement is committed to adhere with Nidaa Tounes Party, noting that ?his relationship with Tunisian President Beji Caid Essebsi is continuous and based on mutual respect for Tunisia?s benefit.? However, in the same interview that was aired on the Tunisian television, Essebsi strongly condemned the statements of Hamma Hammami, spokesman of the Popular Front, that Beji Caid Essebsi paves the way for the succession of power to his son. He said: ?Hamma Hammami?s statements cannot be considered as a reference.? 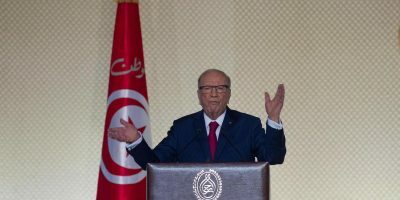 Essebsi cited the Quranic verse:? ?O ye who believe! If a wicked person comes to you with any news, ascertain the truth, lest ye harm people unwittingly, and afterwards become full of repentance for what ye have done.? ?Essebsi clarified that he means wickedness in its Quranic meaning. The Tunisian president was surprised by the fact that every week the press assigns full pages for Hamma Hammami to insult president Essebsi. He added, ?When talking about the Tunisian president, Hamma Hammami should respect him as Essebsi represents one million and 700 thousand Tunisians, while he does not represent more than 200 thousand Tunisians.? He continued: ?Hammami presents himself as an alternative president and he has only to wait for the 2019 elections.? On the other hand, Essebsi considered that what the deputies who opposed the administrative reconciliation bill did during the general parliamentary session is ?a sabotage act and against democratic progress.? He said: ?The opposition deputies have disrupted the work of parliament, which the Tunisian people trust.? He called on the opposition to respect the majority in parliament, saying: ?Just as the majority has to respect the minority, the opposition has also to respect the game of democracy and the majority in the parliament.? Concerning the municipal elections that were postponed, the Tunisian president said: ?Accomplishing the municipal elections depends on completing the composition of the Independent High Authority for Elections, including its president.? He added: ?It is possible to agree on another date for the municipal elections,? as he put it. The president of the Independent High Authority for Elections, Anwar Ben Hassan, said: ?The delay in the municipal elections costs the High Authority 1.3 million Tunisian dinars per month, given that the Independent High Authority for Elections has more than 1025 staffmembers and officers.? The Tunis Afrique Press Agency quoted Ben Hassan as confirming that ?the High Authority wanted this meeting to be an opportunity to discuss the 25th of March, 2018 as a suggested new date by the High Authority for the municipal elections, in the presence of the parties? representatives, the Head of Government, the President of the Republic and the President of the Parliament.? He pointed out that the attendees ?unanimously agreed that there is no way to postpone the municipal elections for an undefined date.? He added: ?Setting a second date for the elections is complex and involves several parties as it is a state?s matter.? He pointed out that the Independent High Authority for Elections considers that the farther from the date of December 17 the elections are , the more complicated they would be. He explained that the further postponement creates an accumulation of the elections? dates, which might result in the exhaustion of voters and confusing them in the electoral cycle. Ben Hassan called for supporting the High Authority?s proposal (25 March 2018) with a clear calendar, stressing that it was agreed with all the political actors who attended today?s meeting to meet for a second time no later than 10 days to submit a calendar that would contain specific dates and deadlines, so that the municipal elections would take place in the date that the High Authority suggested.